If you don’t mind I thought I’d start the week off with a curve ball, as I really enjoyed watching a few films from the “Pernnial Plate” this morning, all investigating socially responsible and adventurous eating. The project is the creation of Daniel Klein and his co-producer Mirra Fine who set themselves the challenge to produce an online weekly documentary 52 weeks of the year, with the series having entered its third season now. The first season they left no stone unturned in Minnesota, before upscaling to travelling across the states in round two. Currently the pair are completing a world tour for the third year having visited as far as China, India, Argentina, and Italy to name a few of their destinations. Today I’ve bundled together two of their most recent films in Japan, with the first introducing us to a bluefin tuna farmer and afterwards, if you’ve still got the appetite, a master of udon noodles and farmer of the land. What’s great about these films in my opinion is the fact they provoke a little thought about the food we eat and the chain we are involved in that is often forgotten. 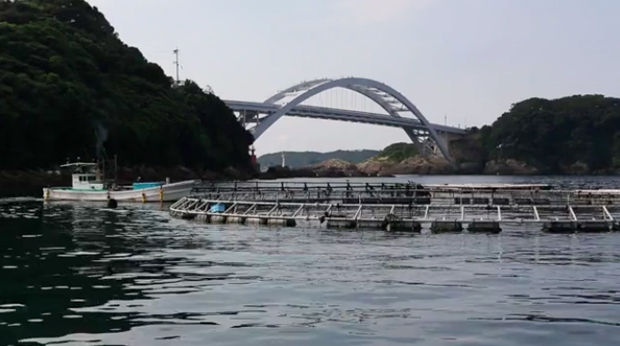 Particularly with the fishery in Wakayama, where they run the only place in the world that spawns bluefin tuna, it makes you consider what’s going onto your own plate and the impact this food is having elsewhere in the world. I genuinely think so many of us are detached from the cycle of our food, it’s too easy now to pick up items from the supermarket and not feel any responsibility for what has gone into producing each product. It left me feeling compelled to support this project here because I really believe that educating people through videos like this is important. It would be great if we could start to see more programmes like this finding their way on to national TV networks, short films start to change opinions when the realities are highlighted in the light of day. I’m a great fan of the internet when it’s used as a vessel to promote transparency, especially when it comes to large companies and corporations that bare a lot of responsibility in my opinion. Much can be taken from these two individuals who have made it their life’s work to support a cause that makes a difference. Shimizu San for example, from the second film, has been growing wheat and making udon noodles for 45 years now. He’s created a space where the locals can come and consume really hearty, wholesome food that’s often fresh from the ground that day. I only wish there was something like this round the corner from where we live, Shimizu has obviously made a real difference for the community around him which is super inspiring to me. If you’ve got the time I’d recommend watching both indivuals as I found each really fascinating and insightful. If you’d like to see more from the Perennial Plate I’ll leave the link just below. I know I’m going to be following this closely in the future, so in the meantime why not watch on below and see what you think for yourself. Enjoy!